To serve customers faster and keep them coming back. It’s easy to install and configures more quickly than other POS software, getting you up and running in a flash. Less training and errors for your new staff. Very little or no computer knowledge is required for our easy-to-use software. From the very first day your personnel will be able to learn the functions of the POS and work independently with minimal supervision. Every action is tracked and requires a security access. 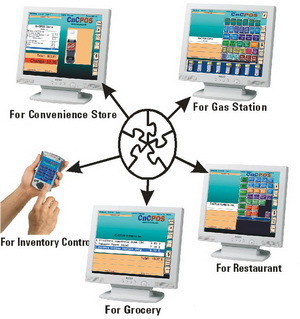 Allowing the owner to monitor all transactions happening while he is there or away. Access the Inventory with on hand management for full Inventory control or real time Inventory, manage your costs, profit, quantity to order, label printing, rentals and see your promotion items. Create promotions and future prices ahead of time. Select items to add to your promotion or future price individually, or include an entire category. The process is very fast and can be reproduced for other promotions by simply changing the date range. The report section offers a multitude of reports, from the very basic to the most complex. Reports can be filtered by date range, operator, department, sub-department, etc... Now you can get exactly what you need. Fill out a simple information form for each employee and view employee profiles with a single click of the mouse. Assign access levels to each employee for increased security. With the CnCPOS Time Clock function, keeping track of employees' working hours is made easier and more accurate than ever. With CnCPOS, no more writing purchase orders, typing invoices and manually updating the inventory! 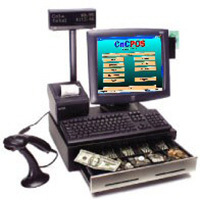 CnCPOS automatically creates purchase orders. The system will check which products should be ordered and in what quantity. It does this by checking your sales during the last period (i.e. : last week) and the same period the previous year and will suggest a quantity to order, never leaving you short handed. You can email, fax or print your purchase orders directly from this section. Also once you receive the invoice, simply select the corresponding purchase order, check to make sure there are no back orders or discrepancies, and update your inventory automatically.